If I never own a fast car (or any car at all! ), if I never have a home with my name on the door, if I never buy myself a solitaire ring – I’ll be okay with my life. When all my cards are played, and all my hair is grey, I’ll sit in my rocking chair and not regret any of those things. But if I don’t visit these places and do these things, I’ll be one cranky old lady. Here’s my secret travel bucket list, out in public for the first time, for you to steal. The cherry trees in Japan burst into riots of flowery pink and white during March through to May, depending on where you are. The cherry blossom, or sakura, is the national flower of Japan, and one of the most iconic symbols in Japanese art. During sakura season, locals and tourists alike stream outdoors to celebrate the arrival of these delights, with parks and gardens becoming central attractions for those months. It’s a short window in which to plan a trip, and many go back disappointed because the delicate flowers have such short life spans, but it’s the challenge that makes the reward so much sweeter. Okinawa is said to be one of the best places to walk down pathways lined with blooming cherry trees. Maybe you’ll see me there next year! Thailand, with its gorgeous beaches and lush greenery, delicious food and beautiful people, is one of my favorite places in the world. If there’s one time of year to visit, in my opinion, it’s during the festival of Lanna which usually falls in November. Monks and locals light candles to fill up beautiful sky lanterns that wobble slowly upward into the indigo night. I’d go to Chiang Mai, where they celebrate both Lanna and Loi Krathong together. During Loi Krathong, the Thai release decorative floats into the rivers, and you’ll also see sky lanterns rising up into the night sky. This is a dying tradition, so it’s best to go while it’s still there. The Chadar Trek is one of the most adventurous treks that a mountain buff can undertake. The furious Zanskar river turns into a sheet of ice for a couple months in winter, forming the only path connecting villages that have been isolated by snow. The trek takes you along a spectacular corridor between canyons, alongside completely frozen waterfalls and beautiful snowscapes, but it’s a tough one. I don’t know how it would feel to hike on ice, while a river rages beneath my shoes, but I aim to find out. This is another one of those places that has an expiry date – a road is being built to connect those villages that were previously unreachable and will make the trek obsolete. That scene from Waterworld, in which Kevin Costner takes Jeanne Tripplehorn underwater in a bubble to see the buildings that are submerged? That’s always been my favorite part of the movie. I don’t know if it’s the tragedy, the mystery, the untouched unchanging world, but there’s just something about underwater cities that fascinates me. Pavlopetri is unique because everything is intact, including buildings. Can you imagine swimming along streets that were once walked upon? I would have to learn how to dive to do this one, but it’s on the list. There are canyons and sinkholes and rock formations and mountains that make you feel tiny and insignificant, but few manmade structures can do the same. The Sphinx of Giza would be one of those. Crouched majestically on the sands, watching as all of us scurry past, in our tiny worlds with our tiny worries, inducing gasps from everyone who sees it – there’s a reason why the sphinx makes it to this bucket list. I saw a photograph once, of a slew of brightly coloured balloons floating serenely over what looked like a moonscape. Ever since, images of blue seas, mystical mosques, magical souks and spiced food have pushed Turkey higher on my list. 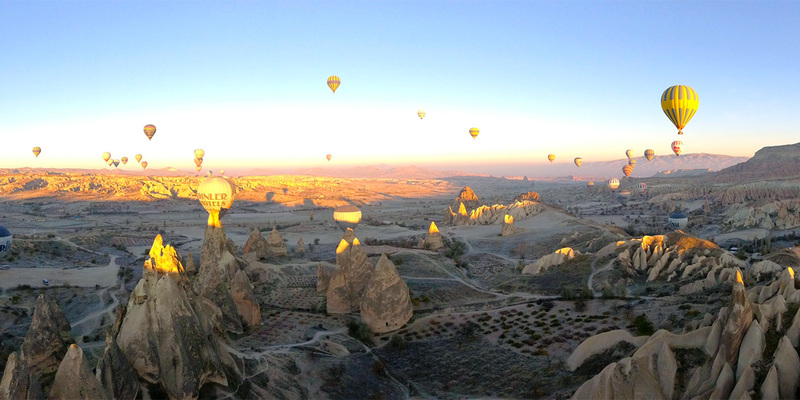 Cappadocia looks like a faraway land straight out of a fairy tale, with caves and spires and turrets all formed out of rock. When covered in snow, it looks even more surreal. I can’t imagine a more perfect way to examine the territory than a leisurely float high overhead in a big balloon. And this one is just for fun! I’m a sucker for unexplained mysteries, so they feature highly on my bucket list. One of the primary reasons I love travelling is the awe and wonder I feel. How often do your local haunts do that for you? And I think an unexplained mystery or a legendary monster would just add to that. The Loch Ness area is one big attraction, with the museums and local legends and lake outings to spot Nessie. Dracula themed tours in Romania or Bulgaria are supposed to be a bit corny, but they’re a must-see for me too. So there you have it – a bucket list you can steal and add to your own. It covers natural miracles, manmade wonders, endurance-testing treks and disbelief-suspending mysteries. What destinations do you have on your must-see list?